An arcade game is a machine that is played using coins. 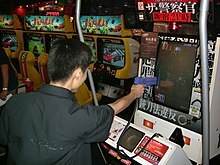 Arcade games are found in restaurants, pubs, video arcades, and other places. Pinball games and video games are two common kinds of arcade games. The Apple App store categorized some apps into a category called "Arcade". One of them is Tiny Wings. This page was last changed on 15 February 2018, at 02:54.